Chris Hajduk reports that the King Eider at Poverty Beach has reappeared: "King Eider has been re-found. I wonder how long it will stick around? Many Common and Red-throated Loons. Some Commons exhibiting breeding plumage. Red-breasted Mergs, Black and Surf Scoters, and a Horned Grebe coming into breeding plumage. Adult Gannets and Bonaparte's Gulls off shore. A flock of 200 Dunlin on the jetty with a pair of Oystercatchers. In other sightings a Harbor Seal and the first pod of Dolphins were seen. - Chris H."
We've got great weather and just a few openings left for Michael O'Brien and Louise Zemaitis's Field Sketching Workshop on Saturday (hit the link and scroll down for the description). Call 609.861.0700 to register. The rollercoaster that is spring birding continues its ups and downs; after two days of rain, we were blessed with sun today, albeit with a chilly breeze at first. The birds responded well and this morning's Cape May Point walk enjoyed Osprey, a good run of close Northern Gannets, the lingering male Eurasian Wigeon and two River Otters (as well as a nice Raccoon). Also of note on the walk was the 25 or so Double-crested Cormorants that passed north in small groups - a clear sign of migration in action. Later in the day, Purple Martins and Tree Swallows were back at the Beanery (visible over the willow pond from Bayshore Road, just north of the Bayshore/Stevens St junction) and Forster's Terns and a Black-headed Gull were at the concrete ship. As well as birds, spring butterflies are showing when the weather is warm; both Eastern Comma and Summer Azure were flying at the Northwood Center today. The Black-necked Stilt persists on the West Cape May Impoundments. Mike Crewe and I had a 5 minute look at the Concrete Ship around noon, where a bunch of Bonaparte's Gulls had a well-hooded Black-headed in it. The local Peregrine was on the water tower along Sunset Boulevard. Mike Hannisian had a vocal Red-breasted Nuthatch in a White Pine Grove on New Bridge Road in Belleplain - that's the road with the bridge upstream from Sunset Bridge. Dave Lord just found the season's first Lousiana Waterthrush at, where else, Sunset Bridge in Belleplain. Woo-hooo! Looks like my prediction that LOWA would arrive by Sunday was off by a few days. If I remember correctly, LOWA arrived on March 31 last year, too. Speaking of predictions, weather and radar guru Dave La Puma's most recent blog makes for an interesting read - crazy weather patterns with potential for vagrants from both north and south, as well as arriving peep and other shorebirds as soon as Thursday. We'll keep you posted, of course. Not much birding going on today. The Black-necked Stilt was reported again at the West Cape May impoundments, and Chris Hajduk had 2 Semipalmated Plovers, apparent arrivals, near the Coast Guard base. Please support this web site, and birds and birding in Cape May, by joining CMBO. Simply visit the membership page and scroll down for all membership options. Join by May 21 to receive the special 2010 edition of CMBO’s annual journal, the Peregrine Observer, featuring accounts and photos of the 2009 Ivory Gull; Pete Dunne's story about his return as Cape May Hawk Counter; 2009 Migration Count results; 2009 Notable Birds; and more! By the way, 60% of our members are from out of state or country. It's only $39 (ind.) and you can join online! Current members (thanks!) will automatically receive the Peregrine Observer, but please invite your friends to join! Several new field trip reports are up on that page; I note that Karl Lukens et. al. did not find the Eurasian Wigeon at Cape May Point State Park on Saturday. New England this weekend. What this will mean exactly is debatable, but it pretty much guarantees arrivals of Louisiana Waterthrush and Yellow-throated Warblers by Sunday, for starters. Add Blue-gray Gnatcatcher to the prospects list. I believe Bank is the only missing swallow species this spring, that's another candidate. And how about Yellow-billed Cuckoo? If that last species stopped you - it should have - we've been a bit remiss, or maybe cautious, in not mentioning a Yellow-billed Cuckoo reported coming in off the water at the Ferry Terminal jetty on Thursday. This is a nuts-early record for the complete migrant, which winters mainly in northern South America and doesn't normally first appear here until the end of April, but the bird flew point blank past the observer. And the plot thickens because a dead Yellow-billed Cuckoo was reported in Masssachusetts three days later! This bird, if right, is much rarer than say the Black-headed Gulls we've been fussing about. Anyhow, migration weather means checking Higbee Beach, and I'll be leading the first CMBO Higbee walk of spring this Friday at 7:30 a.m. The Sound of Spring - Drip, Drip, Drip!! It's another wet day here at Cape May, but I guess that's spring for you; though those people with flooded yards will really be wondering when it's all going to end. The weather has deterred too many folks from venturing out today, but I did go over to the West Cape May Impoundments at lunch time and confirmed that the Black-necked Stilt is still present and easy to view. It was too wet and horrible for pictures today, so here's a nice photo of the Black-necked Stilt taken by Karl Lukens on the day of its discovery. CMBO's Intro to Bird Photography Workshop, led by professional photographer (and excellent teacher) Scott Whittle, had some good opportunities for practice along the Delaware Bay this afternoon, as new birds had arrived or even were arriving as we watched. These included 4 Piping Plovers (I hear Richard Crossley had two more on the beach in Cape May today), several Ospreys, a flock of 16 Great Egrets, and many more Forster's Terns than there were yesterday. There are still a very few spaces on our second photo workshop April 10-11. Northern Gannets, in groups of 5 to 20, streamed out of Delaware Bay early this morning, as viewed from the end of Sunset Blvd. at the Concrete Ship. Don Freiday reports that the Black-necked Stilt is again in the West Cape May impoundments this morning. It's being seen in the same general area as yesterday: the very back portion of the main impoundment. So, if you have a scope, bring it! In other news, Glen Davis saw an adult Lesser Black-backed Gull from the ferry this morning. A brief driving tour through Belleplain State Forest turned up 10+ Pine Warblers, but no evidence of any other arrivals. Though it was a fabulous sunny spring day today, the thermometer at my house didn't reach the 40F mark as a chilly wind blew through Cape May. Spring continues to send us little feathered gifts in ones and twos and at least one of the Black-headed Gulls was reported again from Miami Beach along the bayshore side of the peninsula. Otherwise, it was quiet and I thought the omens looked bad when I hit Groundhog Day! Yes, I saw my first Woodchuck of the year today, but the sun was shining on him, so hopefully that bodes well for an end to all the rain we've been having. Well luckily Groundhog Day didn't settle in, as Sam Gallick pulled a star bird out of the hat - a fine Black-necked Stilt on the canal impoundments in West Cape May, just east of Route 626 bridge and south of the canal bridge. Observers there later in the afternoon also found a Least Sandpiper. A quick Post Script: Tom Magarian tells me he counted 860 Northern Gannets flying north off 2nd Avenue between 5 and 6pm today - an impressive movement. High tide and sundown coincided tonight, and after work I drove down the bayshore wondering what the Bonaparte's Gulls do at night, high tide or not. Almost no gulls occupied the standard spots along the bay, but a flock in the Cape May canal at the Cape May-Lewes ferry terminal answered the question - 100 or so Bonaparte's Gulls were there, with one adult Black-headed in the mix. A ferry departed as I arrived, and for a while the gulls fed in the roiled water left in its wake. Then, en masse near dark, they rose and swept out the inlet, circled a bit, and settled on Delaware Bay. Gulls roost where they think they are safe from predators, and for the Bonies - and Black-headed - that meant open water tonight. The winds came up early, the rain came down, and last night's hoped for flight of early migrants seems not to have materialized, although Dave LaPuma noticed an apparent influx of Golden-crowned Kinglets in his neighborhood, a likely candidate species for late March migration. I hear at least one of the Black-headed Gulls was seen today from the end of Miami Avenue in the Villas. 5 Species of Swallow, Red-Necked Grebe, Common Eider, Snowy Egret, and tomorrow? Mike Crewe, Richard Crossley et. al. teamed up to find 5 swallow species yesterday at the Beanery, along Bayshore Road in Cape May: Cliff (early arrival), Barn (arrival), Rough-winged (arrival), Tree and Purple Martin. Karl Lukens et. al. had the Red-necked Grebe again yesterday, in Great Channel south of Stone Harbor, north of Nummy Island, but it was not there this morning, or at least Richard Crossley and I did not see it. A Pine Warbler was chipping in the shrub island at the base of the free bridge to Nummy Island, and a single Greater Yellowlegs was on Nummy Island. Flocks of Laughing Gulls soared and swam, very obviously glad to be back. Mike Hannisian detected a female Common Eider at the 8th Street jetty in Avalon last night. Dave La Puma just poked his head in my office and said, "Tomorrow." I agree, the prospects are good for a nocturnal migration grounded by impending rain on Friday. Check Dave's woodcreeper web site, but, like I just told him, blame him if it doesn't happen ;>). I've been musing on early spring over the last few days and, you know, March is a devil for playing tricks on us! The first Osprey or Laughing Gull turns up (ALWAYS found by someone else of course!!!) and immediately we expect the flood gates to open. We go out (wrapped up in cold weather gear!! ), all excited at the prospect of finding a whole host of summer migrants and find - nothing! For days on end!!! And that's spring for you. We know in our heart of hearts that it will be another month before birds are really a-hopping, but we fall for it every year. So this year, I've hung back and looked for more subtle changes that are taking place, and signs of things on the move. The first thing I noticed just a few days ago was that, whilst there are still plenty of White-throated Sparrows around Cape May Point, the ratio of adults to first-winters has changed dramatically. I've still got 15 or so White-throated Sparrows coming to my feeder at home and there's a similar number at the CMBO store feeders, but amongst those 30 birds there's just three adults. Mid-winter, zebra-headed adults were plentiful and easy to find, yet now, they're mostly gone. And this is typical for many migrant species; the brightest, butchest adult males will be first back on territory, claiming the best locations and already in full song by the time the females arrive. Young birds, breeding for the first time, will usually arrive after the vanguard and settle for sub-optimal habitats, unless they can claim an unoccupied territory where last year's occupant has not made it through the winter. The same scenario is apparent in the reduced number of American Wigeon on Lighthouse Pond; a month ago, the vast majority of birds were paired up (most duck species display and pair up on the wintering grounds, then head north together), now there's a much higher percentage of loners floating around, and many of these - if you look hard for traces of old feathers - are first-year birds. Another sign of spring is the urgency of migration, which is usually far greater than in the fall; birds are in a hurry to get to the breeding grounds and chasing after a reported bird of interest can be more frustrating than in the fall - more often than not, it's gone before you get there! Sitting and watching a single spot over a period of time (or repeatedly visiting the same spot) can demonstrate this nicely. Yesterday I paid three visits to the Willow Pond at The Beanery, following on from Scott Whittle's original report of swallows and martins feeding there. It would be easy to assume that the same birds were present throughout the day, yet each visit provided different counts. At lunch time, nine Purple Martins, 12 Tree Swallows and one Barn Swallow were present. When I passed by after work, I found eight Purple Martins, three Tree Swallows and a single Cliff Swallow. Returning in the evening, I watched birds coming and going and came up with 10 Purple Martins, six Tree Swallows, two Barn Swallows, one Cliff Swallow and one Northern Rough-winged Swallow. A nice example of similar species with similar requirements drifting through and ending up at the same spot. Finally, Don touched on the fact that Ospreys have been 'in' for a while now, yet many of us birding at Cape May Point hadn't seen one until yesterday. This is another feature of spring, where some species have individuals that seem capable of sneaking in straight to breeding sites without being seen on the way through! Ospreys are typical of this; in the UK where I come from, the first Osprey records are almost always of breeding birds at nest sites in Scotland, which somehow move up through the Brtitish Isles undetected. It can be several weeks before birds are then seen on passage further south in England and these later birds are probably heading further north, perhaps to Scandinavia. The same seems to hold at Cape May, where local breeding birds get sighted on their nest platforms before migrants are reported at the point. Indeed, yesterday was clearly a good migration day for Ospreys as I saw a total of seven birds during the course of the day - all heading in the same direction, north-east, on a south-westerly wind and clearly cutting across Cape Island and heading for the shore. This is the Cape May Birding Hotline, a service of New Jersey Audubon’s Cape May Bird Observatory. This week's message was prepared on Thursday, March 25, 2010. Highlights this week include sightings of BLACK-HEADED GULLS, RED-NECKED GREBE, EURASIAN WIGEON, LESSER BLACK-BACKED GULL, COMMON EIDER and HARLEQUIN DUCK plus apparent arrivals of SNOWY EGRET, ROYAL TERN, CLIFF SWALLOW, ROUGH-WINGED SWALLOW, and BARN SWALLOW; an announcement about a second weekend for the CMBO Optics Sale March 27-28, 2010; and an announcement about CMBO membership. The 3 BLACK-HEADED GULLS continue on the lower Delaware Bay. There is one 1st cycle; an adult which as of March 25 has a nearly full hood; and another adult with a partial hood. Look for these birds from Cape May Point north along the bay at places like Sunset Beach, the Cape May-Lewes Ferry Terminal, the mouth of Cox Hall Creek, and the end of Miami Ave. in the Villas. A RED-NECKED GREBE was seen in the Great Channel, the body of water flowing under the Stone Harbor free bridge near Nummy Island, most recently on Wednesday, March 24, 2010. The EARED GREBE reported last week has not been reported again. One drake EURASIAN WIGEON continues on Lighthouse Pond as of Wednesday, March 24, 2010. A 2nd cycle LESSER BLACK-BACKED GULL was seen at Stone Harbor Point on Tuesday, March 23, 2010, and an adult was seen on the beach in front of the Cape May Meadows on Monday, March 22, 2010. 3 HARLEQUIN DUCKS, 2 adult males and one immature male, were noted at the 8th Street Jetty in Avalon on Wednesday, March 24, 2010. A female COMMON EIDER was there Thursday, March 25. Apparent spring arrivals follow. A SNOWY EGRET was seen adjacent to the Cape May Bird Observatory Center in Goshen on Friday, March 19, 2010. An early ROYAL TERN was located on Stone Harbor Point on Tuesday, March 23, 2010. CLIFF SWALLOW, BARN SWALLOW AND ROUGH-WINGED SWALLOW all arrived on Cape Island at the Beanery on Wednesday, March 24 2010. CMBO’s Optics Sale will be held a second weekend, Saturday and Sunday, March 27 and 28 from 9:00 a.m. to 4:30 p.m. at the CMBO Center for Research and Education in Goshen. A large selection of closeout, demo, factory-refurbished, new and used optics will be priced to move. Binoculars and spotting scopes from all major brands will be available. There are no advance or phone orders: first come, first served. You must be a member of NJAS or CMBO to take advantage of these great deals, so join today if you’re not already a member. If you appreciate this hotline service, and care about the birds of Cape May, please consider becoming a member of Cape May Bird Observatory. Join by May 21, 2010 to receive this year’s special edition of CMBO’S annual journal, the Peregrine Observer, featuring accounts and photos of the 2009 Ivory Gull from some of Cape May’s finest birders and photographers; Pete Dunne’s story about his return as Cape May Hawk Counter; 2009 Cape May Migration Count results; and much more! Current members will receive the Peregrine Observer automatically, but please invite your friends to join! Loon Breakfast + Harlequins, etc. I spent about an hour on the 8th Street Jetty in Avalon this morning before work, mainly watching foraging loons. Common Loons eat a lot of crabs in winter - the one pictured brought three to the surface in the course of about 20 minutes, which leads one to speculate, just how many crabs are there under the waves? A dozen plus Common Loons and 3 Red-throated Loons were in view from the jetty. Let's just hypothesize that a modest average of 10 loons hang out at the mouth of Townsend's Inlet every day from November through March, and each eats a modest 5 crabs a day. That's 7500 crabs! Then what about all the Red-throated Loons, scoters, eiders, harbor seals and other crab-eaters? Speaking of eiders, this was the first time this year I found no Common Eiders at Avalon, though I didn't bring a scope so they could have been hidden far offshore. Three male Harlequins were present, 2 adults and one immature - which, since there had been at least two immature males and one female, means at least 5 total have visited Avalon this winter. 13 Harlequins were counted by the Seawatch last fall. The scoter and Long-tailed Duck flock is diminished - I saw maybe 100 scoters and 50 Long-taileds. Results from this morning's CMBO Birding Cape May Point walk are up on Field Trip Reports. Eurasian Wigeon was found, but what I find more interesting is that Karl et. al. indicated that the Osprey at the end of the walk was a year bird for most people. The leaders are all active birders - but seldom leave Cape Island! Ospreys have been "in" for a while now, but normally arrive first on the Delaware Bayshore. A Royal Tern dropped in with some gulls roosting on Stone Harbor Point this evening, possibly a record early bird. The earliest record I can find easily is the one Michael O'Brien had last year on March 29 (thanks, eBird! ); the early date in Sibley's Birds of Cape May is March 30. Among the gulls was a 2nd cycle Lesser Black-backed Gull, mixed in with a flock of Laughing Gulls. 300 or more Laughers were in the vicinity of Hereford Inlet tonight, viewed from the North Wildwood sea wall. A quick check of Great Channel, the water body flowing under the free bridge from Stone Harbor to Nummy Island, yielded a/the Red-necked Grebe. In addition to the Little Blue above, Mike and Nancy Hannisian had the Black-headed Gulls at Miami Avenue today, as well as a male Eurasian Wigeon on Lighthouse Pond west at Cape May Point State Park. Lots of song happening this morning, aptly enough on the Cape May National Wildlife Refuge Songbird Trail on Kimble's Beach Road. Singers included Pine Warbler, Field Sparrow, Eastern Bluebird, and Eastern Towhee - perhaps we'll bring the April 24 Backyard Bird Sounds workshop here. "The" Great Egret was perched over his pond on Kimble's Beach Road as usual, but when I got to the end of the road 7 more Great Egrets and a single Snowy Egret were waiting. The bay was choppy, but there were good numbers of Red-breasted Mergansers and some Greater Scaup visible. 3 Wood Ducks flushed from the flooded woods along the Songbird Trail. Mike Crewe reports that the Cattle Egret was on the Stevens Street winery pond this moring. Please support this web site, and birds and birding in Cape May, by joining CMBO. Please go to the membership page and scroll down for all membership options. Join by May 21 to receive the special 2010 edition of CMBO’s annual journal, the Peregrine Observer, featuring accounts and photos of the 2009 Ivory Gull; Pete Dunne's story about his return as Cape May Hawk Counter; 2009 Migration Count results; 2009 Notable Birds; and more! By the way, 60% of our members are from out of state or country. It's only $39 (ind.) and you can join online! Current members (thanks!) will automatically receive the Peregrine Observer, but please invite your friends to join! After a spell of watching Northern Gannets, Red-throated Loons, Long-tailed Ducks, Forster's Terns, Bonaparte's Gulls &c. at Sunset Beach during a downpour, we managed to get in the inaugural CMBO Monday Meadows walk, as we hopefully will every Monday from now until mid-November. TNC has drawn a lot of water off the meadows, a.k.a. the Cape May Migratory Bird Refuge - and it continues to pour out - making the habitat look especially good for shorebirds, which is TNC's objective. It seems to shout Pectoral Sandpiper, or even Ruff. In the shorebird department, we flushed 3 Wilson's Snipe and had separate groups of 2 and 3 Greater Yellowlegs fly in, as well as 2 Piping Plovers on the beach where, by the way, you can't get to the ocean without wading the as yet unnamed pond that has formed below the dune. An A4Y alternate plumage - adult breeding in plain language - Lesser Black-backed Gull joined the other gulls on the beach while we watched. Duckage was diverse, including 2 pairs of Blue-winged Teal, 1 of Northern Pintail, and a single Ring-necked Duck. Belted Kingfisher, Tree Swallow, nice groups of Green-winged Teal and shovelers, a little of this, a little of that. . . the full list for the meadows walk is up on Field Trip Reports, as are a set of reports on CMBO's Sunday excursions to Turkey Point, Corbin City et. al. A male Purple Martin foraged with Tree Swallows over the very wet Beanery post-walk today. Yesterday morning I cycled along the Bay, bumping into both adult Black-headed Gulls in the vicinity of Cox Hall Creek, along with several of Cape May's birders. The radar was really lit up with migrants Saturday night, and I wondered to Dave LaPuma, what were they? I proposed yellow-rumpeds, Pine Warblers and other early landbirds; he suggested ducks? Shorebirds? A pile of yellowlegs apparently appeared at Turkey Point Sunday morning, perhaps they were responsible for some of the marks on the radar. Yellow-throated Warblers were apparently not part of the migration - plenty of people were looking for this likely next arrival, but none were found. More Pine Warblers appeared overnight, with a single at Villas WMA in the morning, and a half-dozen or more in Belleplain still singing sporadically in the afternoon. Support this web site, and birds and birding in Cape May, by joining CMBO. Please go to the membership page and scroll down for all membership options. Join by May 21, 2010 to receive the special 2010 edition of CMBO’s annual journal, the Peregrine Observer, featuring accounts and photos of the 2009 Ivory Gull; Pete Dunne's story about his return as Cape May Hawk Counter; 2009 Migration Count results; 2009 Notable Birds; and more! By the way, 60% of our members are from out of state or country. It's only $39 (ind.) and you can join online! Current members (thanks!) will automatically receive the Peregrine Observer, but please invite your friends to join! Many might wonder, perchance, what in tarnation is/are 'Chroicocephalus.' In the wholesale slicing and dicing of the genus Larus a while back, we got the opportunity to learn a number of new genera, as that admittedly overlumped genus was split asunder. Interestingly, replacing the easily said and remembered Larus for such common species as Bonaparte's and Laughing gulls were some tongue-twisters, Leucophaeus for Laughing and Chroicocephalus for Bonaparte's. So, the dainty Bonaparte's Gull now has a genus name nearly as long as the beast! Well, in 120-point type, anyway. Anyway, a couple of adult Black-headed Gulls have been unreliably reliable along the southern Cape May County bayshore from the Ferry Terminal north to Norbury's Landing, with the two most reliable sites being the mouth of Cox Hall Creek and the end of Miami Avenue in Villas (an area termed Miami Beach), just south of Norbury's. At Miami Beach, they are most reliable near the low tide. Though these birds are often found with or near the main Bonaparte's flock, they are also quite often independent of that flock. 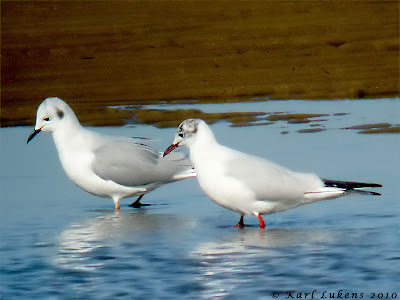 Of late, it has been easy to tell the two Black-headed Gulls apart from each other as one of them has been molting in its alternate head plumage, while the other has remained steadfastly in basic plumage. In fact, the 'prettier' individual is also readily picked out from the hordes of Bonaparte's because its head is so dark, while the smaller species has, for the most part, not initiated pre-alternate molt. I spent a couple hours yesterday on Miami Beach hoping to photograph the two Black-headed Gulls, and managed half my goal. I got pictures, twice, of the 'pretty' one, but nothing of the basic-plumaged bird. However, those pictures did offer me the opportunity to determine the rate of plumage change exhibited by this individual, as I had photographed it on the 11th at the mouth of Cox Hall Creek. The picture below is a composite of two photos and one can easily see how quickly the bird's head plumage is changing. Quite serendipitously, while editing last night some of the pictures that I had taken that afternoon, I chanced across the most recent issue of Colorado Birds (January 2010). In that issue, good friends Jerry Liguori and Bill Schmoker authored a paper on the "Photo recovery of a Harlan's Red-tailed Hawk in Colorado and Alaska." The paper provides the details on an individual adult light-morph Harlan's Hawk that winters in Boulder Co., CO (and which has been photographed extensively there by Schmoker and others, including yours truly). The bird was noted on spring migration in southern Alaska, seen and photographed there by Liguori (who some might remember as having conducted the Cape May hawkwatch a while back and who is the author of Hawks From Every Angle). Though the paper is not available online, the two pictures appeared on the cover of that issue (top image from AK, bottom from CO) and that can be seen on the Colorado Field Ornithologists' website. I read the paper (again) and got back to my photo editing. While editing some pictures of Bonaparte's Gulls, I noted that one bird had an odd black spot in the middle of its lesser primary coverts. My first thought upon seeing that was, "that will make this bird identifiable as an individual should anyone find it elsewhere!" That is because not only was the shape of the spot odd, but the very presence of the spot is odd, as adult Bonaparte's Gulls should completely lack such things. Once I finished up editing pix from the 20th, I decided to check out my pictures of the Black-headed Gull from the 11th at Cox Hall Creek with the idea of checking the bird's plumage progression in mind. I had put together the composite picture of the bird and was just glancing through some of the Bonaparte's Gull pix in the same folder and THERE WAS THAT BONAPARTE'S GULL! This composite nicely illustrates the black spot in question, but more focused ogling provides even more bits that help prove that it's the same individual, including the whitish tip of p5 (the fifth primary, or sixth one counting from the outside; primaries are numbered from the inside out), the long black edge to the outermost primary (this feature is quite variable in the species), and the distinctly-paler-but-still-gray sixth greater primary covert. So, anyone that finds herself/himself looking through adult Bonaparte's Gulls this spring or summer, check the middle lesser primary coverts for a small triangular black spot! And, by all means, get a photo of the bird if you see it! Boy, it feels good to walk around in Teva sandals and rolled-up jeans just soaking up the sun. As Dave La Puma has put it, we've got some weather on tap to put birds in the neighborhood. . .and birds are already here. I don't think anyone relocated Bill Boyle's Red-necked Grebe from yesterday, but Bill reported that both the Little Blue Heron and Cattle Egret were at the pond at the junction of Seashore and Academy Road this morning, just north of the Cape May Canal. Tony Leukering found the 2 adult Black-headed Gulls at Miami Beach in the Villas this evening. Results from the CMBO evening walk at the meadows on Friday and Saturday's Birding Cape May Point are up on Field Trip Reports. It's noteworthy that Karl et. al. found one of the Eurasian Wigeon on Saturday - they'll be leaving us any day. On a walk I took this afternoon at Villas WMA, only 3 American Coots, Mallards and Canada Geese graced the pond there that has held Ring-necked Ducks, wigeon, Gadwall &c.
Mike Hannisian had 4 species of butterfly today, those being Mourning Cloak, Question Mark and Comma in Belleplain State Forest and a Cabbage White in his yard. Cape May butterfly expert Will Kerling was on the beach today watching 120 Northern Gannets fly south (interesting) past Avalon. I wandered Stone Harbor Point today, encountering many American Oystercatchers chasing about like the Keystone Cops of the beach they are, and a Piping Plover. There were plenty of Horned Grebes, a dozen or more, visible from various points on the point, and multiples of both loons, but nothing fancier. Well over 100 Laughing Gulls were around, and I was wishing I had a clicker to count all the Atlantic Brant. A Harbor Seal poked his head up amidst waves breaking over the sandbars at the tip of Stone Harbor Point, where Champagne Island, it appears, will lie beneath the waters of Hereford Inlet for another year. A few sand dunes sit like islands on the Stone Harbor Point flats, and hopefully some of the Black Skimmers and terns will be able to nest there this year. I think my favorite bird of the day was a Mourning Dove carrying nesting material to the cedar thicket on Nummy Island. Doves are early nesters thanks to their ability to produce crop "milk," but anything nesting just makes one feel like winter has been kicked in the teeth. A nice run of weather. . .
Support this web site, and birds and birding in Cape May, by joining CMBO. Please go to the membership page and scroll down for all membership options. 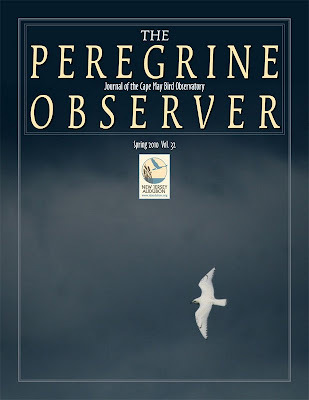 Join by May 21, 2010 to receive the special 2010 edition of CMBO’s annual journal, the Peregrine Observer, featuring accounts and photos of the 2009 Ivory Gull; Pete Dunne's story about his return as Cape May Hawk Counter; 2009 Migration Count results; 2009 Notable Birds; and more! 60% of our members are from out of state or country. It's only $39 (ind.) and you can join online! Current members (thanks!) will automatically receive the Peregrine Observer, but please invite your friends to join! Bill Boyle's got a Red-necked Grebe at the north end of Nummy island right now, the first one of them I've heard about in Cape May this year. Bill reports NOT finding the Eared Grebe, similar results to others today and yesterday. Mike Crewe just reported that the Cattle Egret continues on the flooded lawn at the junction of Seashore Road and Academy Road, just a bit north of the west Cape May bridge over the Cape May Canal, and that a/the Little Blue Heron has joined it. Join CMBO Now to Receive 2010 Peregrine Observer! I'm much more a birder who carries a camera than a photographer, but yesterday morning before work I set up to try to get "crushing" shots of gulls and terns on the bay. The incoming tide pushed birds closer and closer, and I was on the ground, motionless, camera on tripod, when. . .
. . .a young Bald Eagle flew over, flushing all the gulls, which flew way out onto the bay and settled for the morning. Aaarrgh. Pretty much every time we see a Bald Eagle on a CMBO field trip, I remind people not to take it for granted; this time I reminded myself. Speaking of photography, Scott Whittle's bird photography workshop was so popular we added a second session, April 10-11. Call CMBO 609.861.0700 to sign up; I believe there is also at least one space left for the March 27-28 workshop. Dave La Puma went outside for lunch yesterday at CMBO-CRE in Goshen and had a Snowy Egret in the marsh out back, another arrival, and Tree Swallow, too. This is the Cape May Birding Hotline, a service of New Jersey Audubon's Cape May Bird Observatory. This week's message was prepared on Thursday, March 18, 2010. Highlights this week include sightings of BLACK-HEADED GULL, EARED GREBE, EURASIAN WIGEON, HARLEQUIN, and RAZORBILL plus apparent arrivals of PINE WARBLER, EASTERN PHOEBE, TREE SWALLOW, CATTLE EGRET, LITTLE BLUE HERON, AND PURPLE MARTIN; an announcement about a second weekend for the CMBO Optics Sale March 27-28, 2010; and an announcement about CMBO membership. The BLACK-HEADED GULLS continue. The first cycle reported last week has not been reported again, but 2 adults have been seen along the Delaware Bay Shore through Thursday, March 18 2010. One adult has very little dark on the head, and the other adult is developing a hood. Look for these birds from Cape May Point north along the bay at places like Sunset Beach, the Cape May-Lewes Ferry Terminal, the mouth of Cox Hall Creek, and the end of Miami Ave. in the Villas, which has been one of the best spots this week. 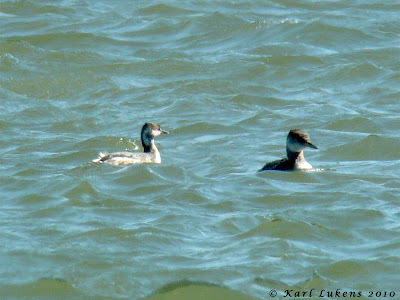 An EARED GREBE was discovered in Hereford Inlet south of Nummy Island on Monday, March 15 and continues through this morning, Thursday March 18, 2010. The two drake EURASIAN WIGEONS continue on Lighthouse Pond as of Tuesday, March 16, 2010. 6 TUNDRA SWANS continue on Bunker Pond through Tuesday, March 16 2010. 2 HARLEQUINS continue at the 8th Street jetty in Avalon through Wednesday, March 17, 2010. A RAZORBILL was seen from the Cape May-Lewes Ferry Sunday, March 14 2010. Apparent spring arrivals this week include CATTLE EGRET, March 16 on Seashore Road just north of the Cape May Canal; PURPLE MARTIN March 16 along Bayshore Road on Cape Island; TREE SWALLOWS March 16 in Belleplain State Forest; EASTERN PHOEBES in Belleplain and on Cape Island March 17; PINE WARBLER in Belleplain March 17; and LITTLE BLUE HERON at the Beanery March 17. If you appreciate this hotline service, and care about the birds of Cape May, please consider becoming a member of NJA’s Cape May Bird Observatory. Join by May 15, 2010 to receive this year’s special edition of CMBO’S annual journal, the Peregrine Observer, featuring: accounts and photos of the 2009 Ivory Gull from some of Cape May’s finest birders and photographers; 2009 Cape May Hawk Count, Morning Flight, and Avalon Seawatch results; Cape May bird notes from 2009; Pete Dunne’s story about his return as Cape May Hawk Counter; and more! Michael O'Brien refound the Eared Grebe this morning. Look towards the ocean from the north side of the toll bridge leading from North Wildwood onto Nummy Island - the bird, and several Horned Grebes, was in Hereford Inlet near where a little spit comes south off the southeast side of Nummy. Michael also had 2 Pine Warblers in Belleplain State Forest, the first report this spring, along with an Eastern Phoebe, also an arriving bird, although at least one phoebe wintered, or attempted to, on Cape Island. Tony Leukering had 2 Harlequin Ducks at Avalon, and Karen Johnson reports that Brown Creeper was singing on Jake's Landing Road, and well it should be on such a beautiful morning. Meanwhile, back at the ranch. . .oops, back on Cape Island, it was a frog symphony last night at around 10:00 p.m., especially of Spring Peepers. 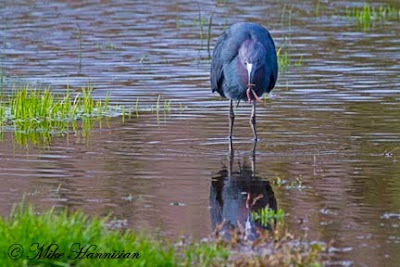 This morning Bob Fogg had a Little Blue Heron on Stevens Street in the flooded winery field. That bird, according to Mike Crewe, flew north into the Beanery, where Richard Crossley reported there were 4 Blue-winged Teal. This morning Tom Reed, Karl Lukens et. al. relocated an Eared Grebe reported yesterday on the jerseybirds list-serve by Chris Vogel. The bird is south of Nummy Island. In addition to the ducks pictured here, Karl Lukens reports the 6 wintering Tundra Swans continue on Bunker Pond, and lots of Bonaparte's Gulls were at the Concrete Ship along with Red-throated Loons and Black Scoters. In keeping with today's spring-like weather, Karen Johnson reports 35 Tree Swallows and 80 Ring-necked Ducks on Tarkiln Lake in Belleplain today. Wood Frogs, Spring Peepers and New Jersey Chorus Frogs were calling on Beaver Swamp Road at noon today, and Will Kerling had a Mourning Cloak butterfly there. Will also had the continuing Common Goldeneye. Tom Reed had a Cattle Egret just north of the Cape May Canal this morning, along Seashore Road at its junction with Academy Road. Mike Crewe found the season's first Purple Martins, 3 birds on wires along Bayshore Road near Stimpson. I poked around a couple places along the bayshore this morning. Cook's Beach Road is heavily and deeply potholed but passable in a vehicle with decent clearance. A male Northern Harrier hunted the marsh there, a marsh much flattened by the snow, as they all are. The "Ibis Pond" on Reed's Beach Road had handsome male Belted Kingfisher perched over a pair of Green-winged Teal, and an adult Bald Eagle sat low in a snag along the road. Megan Crewe got a new yard bird yesterday when the two Sandhill Cranes made a loop over the fields neighboring New England and Bayshore roads at about 3 in the afternoon, and then headed north over the canal. Perhaps they will wind up at Villas WMA, where a single crane had been seen occasionally earlier in the winter. Which reminds me, a pair of Blue-winged Teal were on the big pond at Villas yesterday late afternoon. A foggy sail across the bay and back today on the Cape May-Lewes Ferry did not yield much in the way of alcids, nor the gannet and loon concentrations we hoped for - we being me, Tony, Warren Cairo and friend Claudia, and Kathy and Roger Horn. We did have a speck that I will persist in calling a Razorbill, though the others may call foul, plus multiple Horned Grebes, and a nice show of all three scoters, though the White-wingeds were only seen in Delaware Waters. Only three Northern Gannets appeared. The big gannet episode of last year was March 28-29, when 50/minute or more were coming out of the bay in the fog on the 28th, and I clicked 600 from the ferry on the 29th, so perhaps a repeat ferry ride in a couple weeks is in order. I hear via Scott Whittle that 60 Red-throated Loons were at the Concrete Ship this morning, with a large flock of American Oystercatchers. Detecting departure dates can be a bit tricky. We notice arrivals, say the first Yellow-throated Warbler of spring, since none have been here, and we long for them. But we tend to take the winter residents for granted as they gradually filter away to the north, not realizing exactly when the last one departed. That being said, I can tell you that on Thursday night 6 Fox Sparrows fed under my feeders until dark. I heard at least one singing in the yard yesterday (Saturday) morning. This morning, none are evident. Certainly Fox Sparrows are still to be found around Cape May. But it would seem my locals departed, probably after the weather cleared yesterday evening. A female Harlequin Duck has been hanging around the Concrete Ship at Sunset Beach this morning. 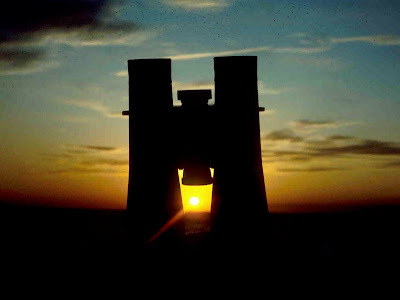 I understand Richard Crossley found it initially. This is the Cape May Birding Hotline, a service of New Jersey Audubon Society's Cape May Bird Observatory. This week's message was prepared on Thursday, March 11, 2010. Highlights this week include sightings of BLACK-HEADED GULL, GOLDEN EAGLE, KING EIDER, COMMON EIDER, REDHEAD, EURASIAN WIGEON; apparent arrivals of FORSTER’S TERN, LAUGHING GULL, OSPREY; and an announcement about the CMBO Annual Optics Sale March 13-14, 2010. The BLACK-HEADED GULLS continue. At least three are present, one first cycle, an adult with currently just a spot behind the eye, and an adult with the beginnings of a hood. See photos below. Recent reports include an adult seen at Fern and Shore Streets in the Villas on Thursday, March 11, 2010, and the first cycle bird with an adult at Miami Avenue, also in the Villas, on Wednesday, March 10, 2010. Look for these birds from Cape May Point north along the bay at places like Sunset Beach, the Cape May-Lewes Ferry Terminal, the mouth of Cox Hall Creek, and the end of Miami Ave. in the Villas. A sub-adult GOLDEN EAGLE was seen at Beaver Dam Boat Rentals in Cumberland County on Sunday, March 7, 2010, a different bird than the adult GOLDEN EAGLE that has been wintering in the area. The immature KING EIDER was seen on Saturday, March 6, 2010 at Poverty Beach. This bird is usually noted around the Coast Guard Jetty, and the Coast Guard Jetty is viewable only by looking north from Poverty Beach. This bird may be at a great distance. An adult male COMMON EIDER has been at Cape May Point; this species is still easily found along the south coast as it has been all winter. 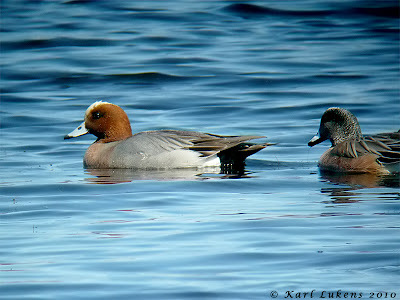 The drake REDHEAD and two drake EURASIAN WIGEONS continue on Lighthouse Pond as of Thursday, March 11, 2010. 12 FORSTER’S TERNS were noted at the end of Hudson Avenue in the Villas on Monday, March 8th, 2010, with more noted the rest of the week. A LAUGHING GULL was seen from the Cape May Lewes Ferry, heading toward the Villas on Monday, March 8th, 2010, with adults seen subsequently this week along the Delaware Bayshore from Norbury’s Landing south. A pair of OSPREYS returned to the Maurice River on Thursday, March 4th, 2010. CMBO’s Fifteenth Annual Optics Sale will be Saturday and Sunday, March 13 and 14 from 9:00 a.m. to 4:30 p.m. at the CMBO Center for Research and Education in Goshen. A large selection of closeout, demo, factory-refurbished, new and used optics will be priced to move. Binoculars and spotting scopes from all major brands will be available. There are no advance or phone orders: first come, first served. You must be a member of NJAS or CMBO to take advantage of these great deals, so join today if you’re not already a member. The latest Black-headed Gull is the adult Dave LaPuma had at the mouth of Cox Hall Creek early this morning. I just showed Dave the picture above and his bird was NOT the same adult, his had much more extensive dark coming in on the head - i.e., it was the one Karl photographed, below. Two adults had been seen together. The young bird makes at least three of this species this spring. Dave and I compared his photos from a couple weeks ago of one adult with a different head pattern, but it could have molted into the pattern on the one he saw this morning. 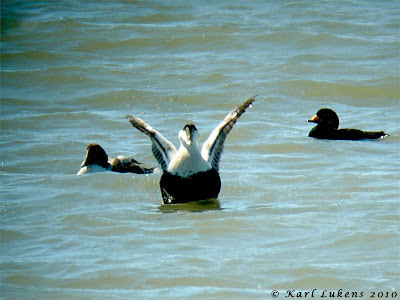 Karl Lukens advises that the female Common Goldeneye was still at Beaver Swamp yesterday, and again had the adult Common Eider at Cape May Point. Karl also had an adult Bald Eagle at Beaver Swamp carrying sticks. I cycled over to Nummy Island early this morning, hoping to find my first Osprey of spring. That didn't happen, but a few American Oystercatchers were there and piping like crazy, along with a Greater Yellowlegs. Time for a binocular upgrade or a new scope? CMBO's annual optics sale is this weekend, March 13 and 14, at CMBO's Center for Research and Education, 600 Route 47 North, Goshen NJ 08210. Doors open at 9:00 a.m., and the sale is only for CMBO or NJAS members (you can join here.) Proceeds support our mission work. The sale includes demos, factory refurbished and used binoculars and scopes. Reps from Kowa, Leica, Manfrotto, Nikon, Swarovski and Zeiss will be on hand Saturday to answer questions. Sorry, no telephone or advance orders, but you can shop for new optics on-line at our store, http://www.featheredgeoptics.org/ . "This past week I was contacted about 4 collared Canada Geese I observed in North Cape May. . .Those four geese were tagged about 2,100 miles away as the crow flies in Greenland this past summer. They mentioned how they also tagged juvs with leg bands, and in the photos you can see a goose with no neck collar but a leg band. It's probably one of them; I can read out two of the three letters/numbers. . . There were also 2 more geese with similar color and plumage characteristics of the tagged geese. All of them sticking together I assume they are part of the same social group and/or family." A report just came in of 5-10 Tree Swallows at Supawna Meadows NWR up in Salem County. A lunchtime walk at Beaver Swamp yielded a female Common Goldeneye. Here's a revealing gem from Stone (1937): "Raymond Otter considers that the Whistler (Goldeneye) along with the Shelldrake (Red-breasted Merganser) are the most common of the diving ducks today." The "Whistler" is not nearly so common today. The Bald Eagle nest at Beaver Swamp failed during the storms, but the nest itself is still there and was occupied by an eagle sitting low in it - but not an adult! The bird was positioned with only head visible, just like it was incubating, which it clearly was not, and another young eagle sat on a hummock in front of the nest. I've been remiss in reporting non-bird critters of interest. New Jersey Chorus Frogs have been calling for several days now, e.g. at the David Douglas Park near the Ferry Terminal and Villas WMA. Their voice sounds like someone running a thumb across a comb, slowly when it's cold, faster when it's warm. Spring Peepers have been calling on Turkey Point Road. Red Bats have been out, e.g. I saw 10+ while driving from Dennisville north to Mauricetown last night. Dave Lord noted the Turkey Point butterfly on Sunday was an anglewing, probably a Eastern Comma.